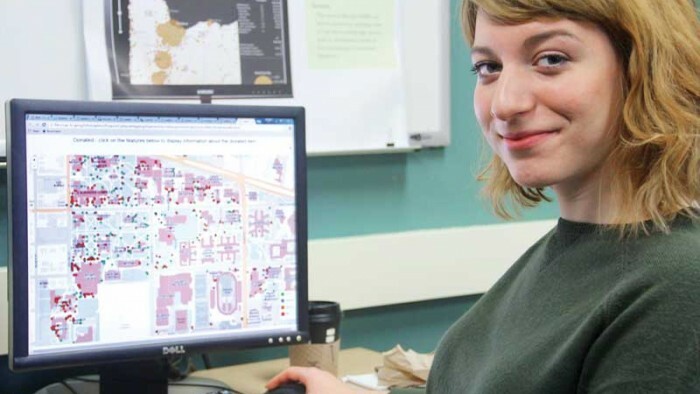 Geographic Information Science within Geography provides students with both the conceptual knowledge base and the technical skills to develop and conduct geospatial analysis and data visualization. This core area emphasizes a broad based approach to GI Science and includes courses, research and training in cartography, geographic information systems, cognitive and information science, and remote sensing. Two labs housed in the Geography Department engage in research projects in GIScience; the Spatial and map Cognition Research Lab and the InfoGraphics Lab. To see a recent feature on both the GIScience in the department and features of students who have gone on the work at places like Apple, click here. The Spatial Computation, Cognition and Complexity (S3C) Lab is located at 160 Condon Hall. Several faculty and student research projects are conducted in the Lab. In general, the focus of these projects is on human cognition, memory, and perception with application in GIS and cartography. The InfoGraphics Lab is located in 163 Condon Hall. The InfoGraphics Lab staff work on a variety of supported projects with faculty, campus offices, and government agencies. Integration of GIS and graphic design tools with cartographic design is a focus of the Lab’s work. Projects range from the creation of major regional atlases to the development of I-Phone mapping applications. 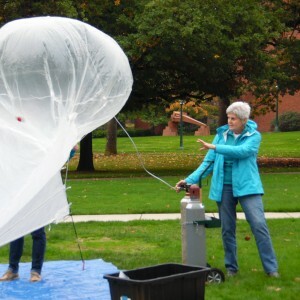 More on the Lab’s projects and staff can be found at http://infographics.uoregon.edu/. What kinds of jobs might a focus in Geographic Information Science prepare you for? These courses focus on developing skills in spatial analysis and vizualization that can be applied in any number of geographic and situational contexts; from mapping tsunami inundation zones, the spread of invasive species, impacts of climate change. to comparisons of socio-economic indications of urban residents. Geographic Information Science courses provides you with highly desirable skills in today’s economy, from spatial analysis with GIS software, to creating and designing effective visual products (such as maps), to remote sensing to understand changes on the earth’s surface. Note: Occasionally GEOG 410 is also offered as a course that would count towards the Geographic Information Science Concentration. Check the Course Offerings (the “pink sheet”) or email the Undergraduate Advisor at geogadvr@uoregon.edu to clarify. 481/581 GIScience I. 4 Credits. An introduction to geographic information science, geographic information systems (GIS), the current population survey (CPS), remote sensing, and cartography. Sequence with GEOG 482/582, 491/591. Bone, Kohler, Lobben. 482/582 GIScience II. 4 Credits. Spatial data collection, spatial data models, database design, data editing, geographic information system (GIS) project management, and advanced topics in geographic information science. Sequence with GEOG 481/581, 491/591, 493/593. Prereq: GEOG 481/581. Bone, Kohler, Lobben, Schmidtke. 485/585 Remote Sensing I. 4 Credits. Introduction to remote sensing science including its physical basis, instruments, platforms, data, processing methods, and applications. Sequence with GEOG 486/586. Prereq: GEOG 481/581. Fonstad, Kohler. 486/586 Remote Sensing II. 4 Credits. The use of digital electromagnetic data for classification, mapping, and monitoring biologic, hydrologic, atmospheric, geologic, and human processes and environmental change. Sequence with GEOG 485/585. Prereq: GEOG 485/585. Fonstad, Kohler. 490/590 GIScience: [Topic] [R]. 4 Credits. Advanced topics on geographic information systems science including spatial analysis and modeling, data visualization, cartography, volunteered geographic information, GIS programming. Prereq: GEOG 481/581. Bone, Kohler, Lobben, Schmidtke. 491/591 Advanced Geographic Information Systems. 4 Credits. Socioeconomic analysis with geographic information systems (GIS) and the U.S. census, network modeling, 3-D models of natural and urban landscapes, web-based GIS and programming. Sequence with GEOG 481/581, 482/582. Prereq: GEOG 482/582. Bone, Kohler, Lobben. 493/593 Advanced Cartography. 4 Credits. Map design and production methods; use of color, cartographic visualization, graphing, data graphics theory, and integration of geographic information systems (GIS) and graphics tools. Sequence with GEOG 481/581, 482/582. Prereq: GEOG 482/582. Meacham. GEOG 494. Spatial Analysis. 4 Credits. 495/595 Geographic Data Analysis. 4 Credits. Analysis and display of geographical data by traditional data-analytical methods and by scientific-visualization approaches. Prereq: GEOG 481/581. Bartlein. GEOG 496. Location-Aware Systems. 4 Credits. Explores technical fundamentals of location-aware systems, such as location models and location-based services, as well as challenges such as user privacy. Prereq: GEOG 481. Schmidtke. 497/597 Qualitative Methods in Geography. 4 Credits. Explores conceptual and practical dimensions of qualitative research. Includes linking theory and method; research question formulation; project design; ethics; data gathering, analysis, and presentation. Prereq: GEOG 341, 342, or 343. GEOG 498. Geospatial Project Design. 4 Credits. Introduction to methods for designing and implementing professional projects involving geospatial data, technologies, and analytical methods. Prereq: GEOG 481. Bone.